ⓘ Heads up, there are affiliate links in this article, so if you buy something, we get a cut of the sales. What Are the Uses & Benefits of Selenium? Who Can Benefit from Selenium? How Do I Take Selenium? Are There Any Beneficial Selenium Stacks? Are There Any Side Effects of Selenium? How Do I Pick a Good Selenium Product? The mineral content of your diet is largely dependent on the soil that grows your food. Today’s soils are becoming deplete of nutrients due to modern intensive agricultural practices that strip nutrients of soils, making vitamin and mineral deficiencies more common in developed nations – and in developing nations, it’s even more of a concern. That is why it is important to be educated about vitamins and mineral supplements that could benefit you. One of the best minerals people can take to ensure their health is selenium, an essential trace mineral that has a multitude of health benefits. In order to help you find a good product we’ve researched & narrowed down the best selenium supplements on the market right now. 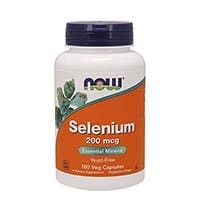 NOW Foods Selenium is a kosher selenium pill that is suitable to vegetarians and provides the consumer with the well-studied selenium dosage of 200mcg. NOW Foods is a natural supplement brand that was founded in 1968 and has since produced affordable and effective natural supplements. They are known for their dedication to natural and sustainable sourcing, and their supplements are all manufactured in GMP certified facilities. Bottom Line: This selenium supplement is good for a variety of health benefits that it can provide. It is formulated with selenomethionine in a GMP certified facility by a reputable brand. ⓘ If you buy something using the link below, we get a small commission. Nature’s Way Selenium can help to support overall health by boosting immunity, supporting the metabolism, enhancing cardiovascular health and lengthening your lifespan. It is made with selenomethionine and is free from gluten, sugar, salt, yeast, wheat, corn, soy, dairy, artificial colors, flavors and preservatives. Nature’s Way, founded in 1969, is one of the best natural supplement brands available today. They are the first major supplement brand to be authenticated with the TRU-ID certification program that shows that the supplement label is accurate. Bottom Line: If you are on a budget, this is a good selenium choice for you. It is an effective product with very few additional ingredients, and it is manufactured in a GMP certified facility. Nature’s Way Selenium offers strong antioxidant benefits at an affordable price to consumers. Pure Encapsulations Selenium is a hypoallergenic selenium pill that is formulated using selenomethionine that provides powerful antioxidant benefits. It is suitable to vegetarians, available at an affordable price, and uses a well-studied optimal selenium dosage of 200mcg selenium per capsule. Pure Encapsulations is a renowned producer of hypoallergenic and effective supplements that provide you scientifically-backed health benefits. All of their supplements are manufactured in GMP certified facilities that exceed United States Pharmacopeia standards. 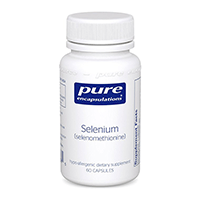 Bottom Line: Pure Encapsulations Selenium is manufactured by a reliable supplement brand in a GMP certified facility and is formulated with the selenomethionine for enhanced antioxidant and absorption benefits. It is hypoallergenic, suitable to vegetarians, clean and even affordable. 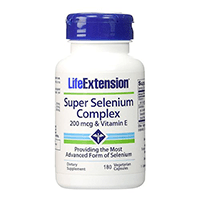 Life Extension Super Selenium Complex is fortified with vitamin E. It has additional antioxidant benefits due to vitamin E (a well-known antioxidant vitamin) – a good selenium stack combination! Life Extension is a nutritional supplement brand that specializes in products that help lengthen your life. Their quality control exceeds FDA standards, and they source the best raw ingredients possible. Bottom Line: This is a powerful source of antioxidants that is affordable and vegetarian. However, it does include more fillers, and it uses a blend of different selenium formations. Thorne Research Selenomethionine is a vegan selenium pill formulated with selenomethionine at a good selenium dosage. This affordable product is free from harmful additives and contains no gluten, eggs, dairy, high-fructose corn syrup or nut-based ingredients. Thorne Research is a reputable supplement brand that has been in the industry for over 30 years. Their supplements are innovative, high-quality and research-based nutritional supplements. 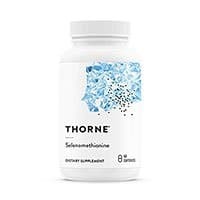 Bottom Line: Thorne Research Selenomethionine is a good choice for almost anyone – it is affordable, free from allergens and vegan. However, some people claim it is less effective. 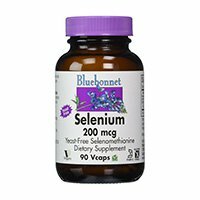 BlueBonnet Selenium provides pure yeast-free selenium in vegetarian capsules. It is formulated with selenomethionine in easy-to-swallow vegetarian capsules and is free from many allergens. BlueBonnet is a natural supplement brand that has been in the industry for around 30 years. They formulate most of their supplements to be non-GMO, organic, allergen-free and KOF-K kosher certified. Bottom Line: This is a good, affordable and effective selenium pick for almost anyone. It stacks up well against the competition. 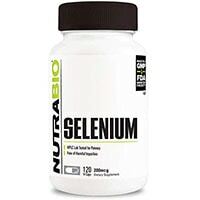 NutraBio Selenium is tested for potency and purity and is manufactured in a GMP certified facility. 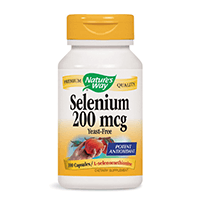 This pharmaceutical-grade selenium supplement is good for a variety of selenium benefits. NutraBio is nutritional supplement company that was founded in 1996 and specializes in weight management and sports nutrition. Their products are manufactured in the USA in GMP certified facilities. Bottom Line: This product can be good for almost anyone because it is vegetarian and free from many allergens. However, it is not formulated with selenomethionine, and it may be lower quality. 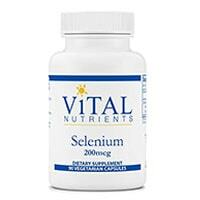 Vital Nutrients Selenium is a potent antioxidant that is suitable to vegetarians. It contains double the usual amount of selenium. Vital Nutrients is a high quality nutritional supplement manufacturer that is dedicated to promoting health. Their supplements are available to consumers worldwide. Bottom Line: This is a very strong selenium product that can be most beneficial to those with a higher risk of selenium deficiency. However, the high dosage is not best for everyone, and it is more expensive. 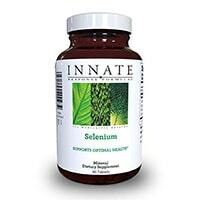 Innate Response Selenium is a clinical whole food nutrition selenium tablet that is formulated with an organic botanical blend, whole food blend, immune blend and bioactive enzymes and proteins. It is suitable to vegetarians, free from gluten and dairy. Innate Response is a natural whole foods supplement brand that focuses on supporting health holistically. It was founded by holistic health practitioner Tieraona Low Dog, M.D. Bottom Line: This is a good selenium choice, especially for those who want a natural and holistic approach. However, it is more expensive, has more fillers and it is not formulated with selenomethionine. 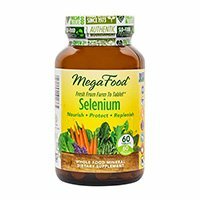 MegaFood Selenium is a whole food selenium tablet that is organic and vegetarian. With the additional benefits of a variety of whole food antioxidants, this selenium product has boosted antioxidant benefits. MegaFood is a vitamin and dietary supplement producer that produces supplements from farm to table. They focus on raw, whole food supplement ingredients. Bottom Line: This is a great selenium pick for those looking for a lower selenium supplement dosage. However, it does not use selenomethionine, and it is more expensive. The lower dosage may also be less effective. Selenium is an essential mineral found naturally in some foods, soil and water. The richest selenium foods include brazil nuts, kidney, liver and fish. It exists in two forms, known as organic selenium and inorganic selenium – their names are descriptive of their sources. For instance, organic selenium comes from a living source, such as fruit. Inorganic selenium comes from an inorganic source, such as soil. It is often found organically as selenoproteins such as glutathione peroxidase, selenocysteine and selenomethionine. This essential mineral is necessary for reproduction, proper thyroid metabolism and DNA synthesis. Selenium deficiency is more common in countries with selenium-poor soil, such as China and the UK. Deficiency may be characterized by male infertility and development of chronic illnesses. Selenium supplements generally use a form of selenium known as selenomethionine, because this is the most common form found in body tissues. Selenium binds to methionine, a powerful antioxidant and essential amino acid, when it is incorporated into body tissues. Selenium products can be found as capsules, tablets, in multivitamins and more. Overall health: Selenium is vital for a huge range of functions in the body, making it a very important mineral for human health. Some research has found that selenium is important for immune health, thyroid function, fertility, mood, and much more. Many people get enough selenium through their diet alone, but people with certain conditions including Crohn’s disease and HIV/AIDs are more at risk for selenium deficiency. A low level of selenium has been linked to poor immune function, cognitive decline and an increased risk of mortality – thus, it’s important to get enough selenium in your diet, or look to supplements for additional selenium. Antioxidant & anti-inflammatory: Selenium has powerful antioxidant and anti-inflammatory properties. Antioxidants help to protect the body’s cells from damage caused by free radicals. Additionally, selenium also boosts the efficacy of other antioxidants like vitamin E, helping to improve antioxidant activity in the body. Selenium also has significant anti-inflammatory effects, helping to curb inflammation and lower the risk of a number of inflammation-related health concerns. Cancer: Selenium may play a role in slowing the progression of cancers of the prostate, lungs, and liver. This is a bold claim, to be sure, and researchers are still evaluating the effects of selenium on cancer cell development – but so far, results are promising. Selenium essentially helps to locate and repair damaged DNA cells, which if left unchecked could lead to cancerous cell mutation. It’s thought that selenium may be particularly important for those with a family history of cancer, and those with weakened immune systems. Cardiovascular health: Low levels of selenium in the body is associated with an increased risk of heart disease, leading some experts to believe that selenium may have a protective role in cardiovascular health. Although, the researchers concluded that since the studies analyzed were observational studies, the validity of the association between selenium intake and heart disease is in question. Additionally, selenium may help to increase blood flow, reduce inflammation, and reduce oxidative damage, all of which can contribute to heart health. Thyroid function: There is a documented link between selenium deficiency and thyroid metabolism. It is thought that selenium helps to regulate the production of reactive oxygen within the thyroid gland, which may also help to protect against thyroid disease. More research is needed, but many medical professionals see significant value in the use of selenium supplements in addressing autoimmune thyroid disorders. Fertility: Low selenium levels have been linked to low sperm motility and infertility in animals and human men. Thus, some researchers believe there may be a link between selenium intake and fertility, particularly for males. Very little research has been done on selenium’s effects, if any, on female infertility. In general, this is an area that needs significantly more research. Overall, selenium is a vitally important mineral for various aspects of health. With that said, the relatively low RDA for the mineral means that many people will get enough of this nutrient from their diets alone. Those at Risk for Thyroid Problems – Selenium is essential for thyroid metabolism. Your thyroid is a gland located in your neck responsible for making hormones, and controlling the rate of things such as your heartbeat and how fast you burn calories. Conditions such as goiter (thyroid enlargement), hyperthyroidism, hypothyroidism and thyroiditis can cause overall health problems resulting in heart palpitations, dry skin, irregular bowel movements, changing menstrual cycles, muscle pain, high blood pressure and more. If you are a woman over the age of 35, your chances of thyroid conditions are at about 30%. Those Living in Selenium-Poor Regions – Certain geographic regions have less selenium in their soils, increasing your risk of selenium deficiency. Soils in China, the UK, Australia, New Zealand, Scotland, Finland, Sweden, Austria, Germany, France, Greece, Western Russia, Turkey, some parts of Canada and the Pacific Northwest of the United States have lower selenium levels. If you live in these regions, you may benefit from a good selenium supplement for deficiency and supporting overall health. Older Adults – Aging adults can benefit from selenium because they can help thyroid issues and regulate metabolism, support cardiovascular health and boost immunity. As you age, you are at a higher risk of developing thyroid conditions, weakened immunity and poor cardiovascular health. Those with Asthma – Selenium has anti-inflammatory benefits that have been studied for asthma. Though studies are not conclusive yet. Selenium supplements can be taken with food at any point in the day. Follow the specific directions on your selenium supplement for selenium supplement dosage instructions. It can interact with other medications, so talk to your doctor before taking selenium to ensure safety. Selenium, Beta-Carotene and Vitamin E – Beta-carotene (a plant pigment) and vitamin E (an antioxidant) along with selenium make a top selenium stack for cardiovascular health. Selenium and CoQ10 – CoQ10 is a powerful coenzyme and antioxidant that helps to support cardiovascular health, and is naturally found in the body. In doses higher than this taken over long periods of time, selenium supplements may cause toxicity. Though most people do not experience side effects, some people may experience nausea, vomiting, muscle tenderness, facial flushing and more. The highest quality selenium supplements are generally formulated with selenomethionine for its enhanced antioxidant benefits and bioavailability. Some formulations are made with S. cerevisiae, or selenium enriched brewer’s yeast. They also should be produced by companies with reliable reputations and contain few additional ingredients. Watch out for fillers, binders and unnecessary additives! Overall, look for a top selenium supplement that fits your budget and is effective. Austin Meadows is an independent writer and consultant specializing in health and wellness topics. With more than 7 years of experience writing in the natural health industry, Austin strives to deliver accurate, concise and research based information to his readers.